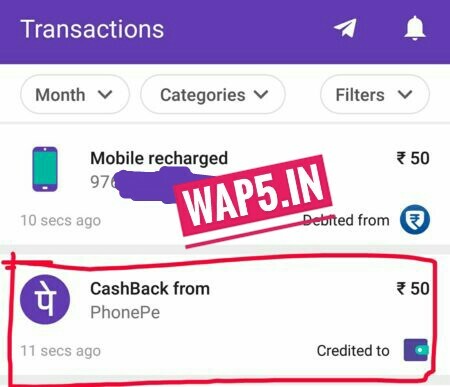 PhonePe App – Get Rs 75 Cashback on Rs 349+ Airtel Recharge, PhonePe Airtel Recharge Offer of Rs 75 Cashback on Rs 349 or above Recharge, 100% Cashback on Airtel Prepaid of amount below to Rs 349. 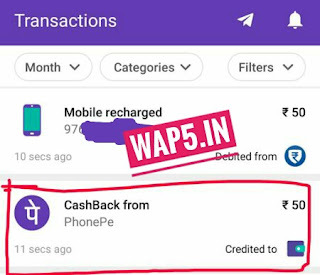 PhonePe has come up with an awesome deal after launching Airtel Prepaid Recharge facility in their Android App, Now Get Rs 75 Cashback on Recharge of Rs 349 or above. Offer is applicable on customer’s first Airtel prepaid/Postpaid recharge on PhonePe. Valid for once per user. So Hurry up and avail this Offer Now !! Note:- There are 2 Offers, But you can avail only 1 offer !! 2nd Offer:- Flat Rs 75 Cashback on Rs 349 or above Recharge. 7) Now Initiate a First Airtel Prepaid Mobile Recharge or Postpaid. 10) You will get the 100% Cashback upto a maximum of Rs 50 of Recharge below of Rs 349 amount & Flat Rs 75 Cashback on Recharge amount above Rs 349. 7) The offer is applicable on all payment modes. 8) The offer is valid only once per Bank Account, Credit Card and Debit Card. 9) Cashback will be credited into your PhonePe wallet within 24 hours of successful completion of the transaction. 12) If the offer overlaps with other existing offers, the maximum of the offers is applicable. 14) PhonePe has the right to amend the terms & conditions, end the offer, or call back any or all its offers without prior notice. 15) In a case of dispute, PhonePe reserves the right to a final decision on the interpretation of these Terms & Conditions. 16) If you have exceeded the monthly wallet transaction limit of ₹20,000, the cashback amount will be credited to your wallet on the first day on the following month.